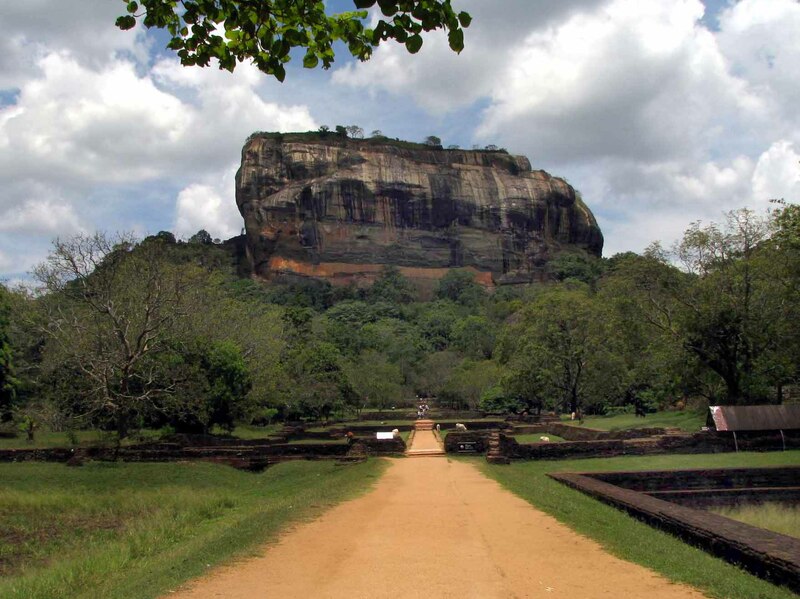 Sigiriya (Lion’s rock) is a large stone ancient rock fortress and palace ruin in the central Matale District of Sri Lanka. It is surrounded by the remains of an extensive network of gardens, reservoirs, and other structures and renowned for its ancient frescos. 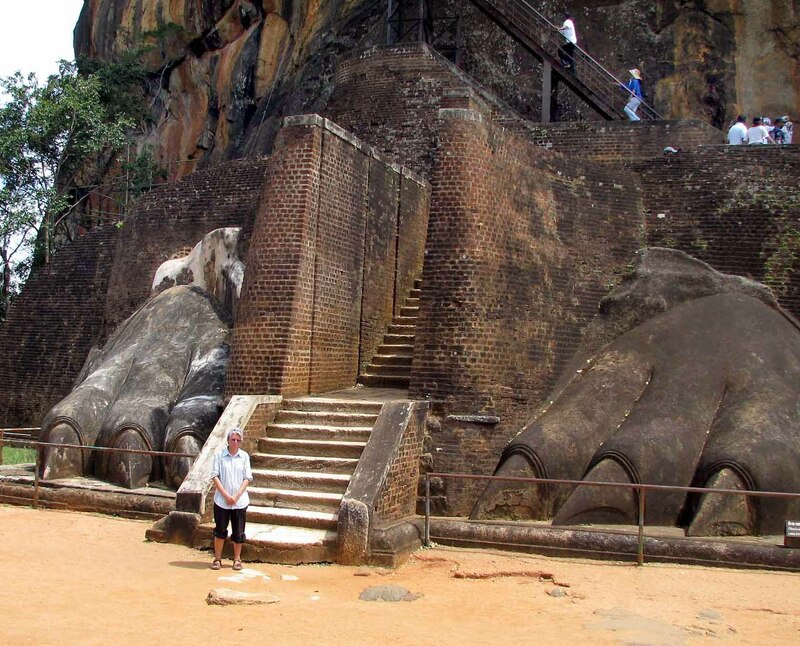 It is one of the eight World Heritage Sites of Sri Lanka. It is also declared by UNESCO as the 8th Wonder of the World. 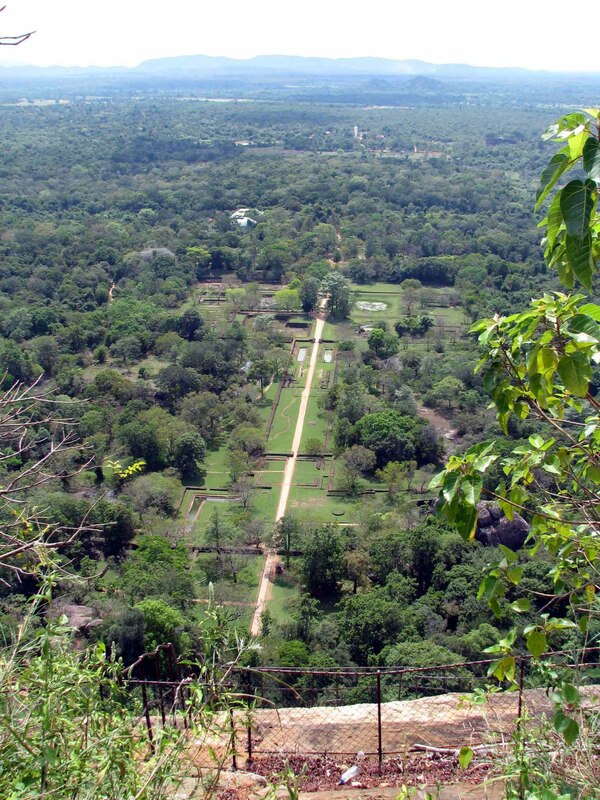 Sigiriya may have been inhabited through prehistoric times. It was used as a rock-shelter mountain monastery from about the 5th century BC, with caves prepared and donated by devotees of the Buddhist Sangha. According to the chronicles the entire complex was built by King Kashaypa (AD 477 – 495), and after the king’s death, it was used as a Buddhist monastery until 14th century. 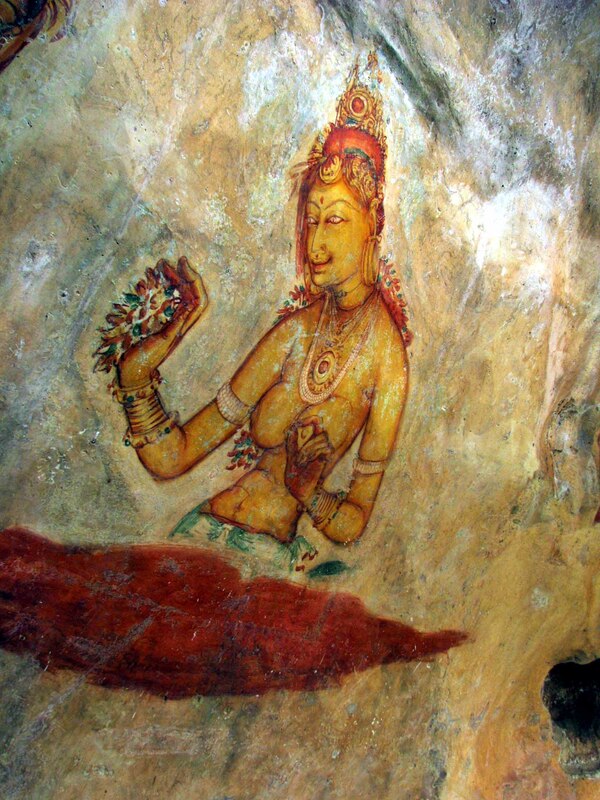 Halfway up the rock, within an inaccessible rocky shelter in the vertical wall of the western face are rock paintings which have brought universal acclaim to the site of Sigiriya – ‘The Maidens of the Clouds’, 21 non-identified female figures, comparable to the most beautiful creations of Ajanta. 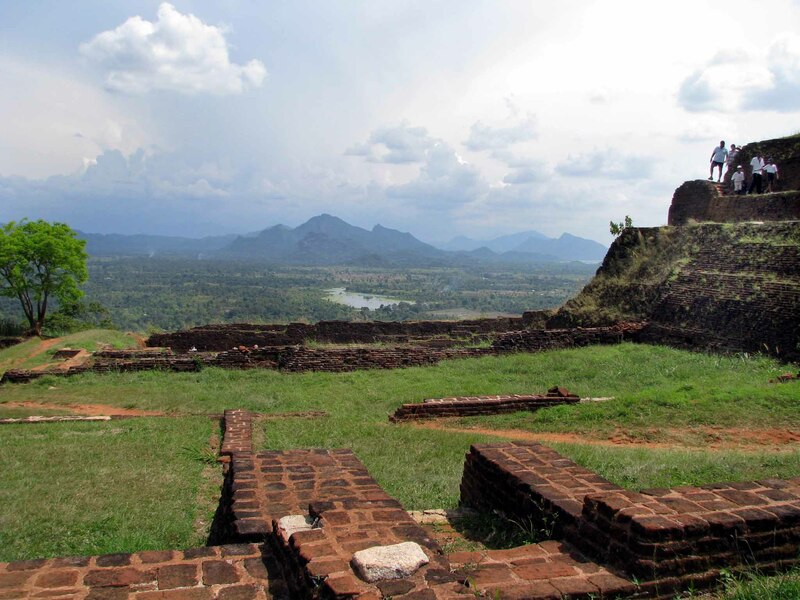 Sigiriya is a unique witness to the civilization of Ceylon during the years of the reign of Kassapa I. The site of the ‘Lion Mountain’ was visited from the 6th century AD, by passionate admirers. 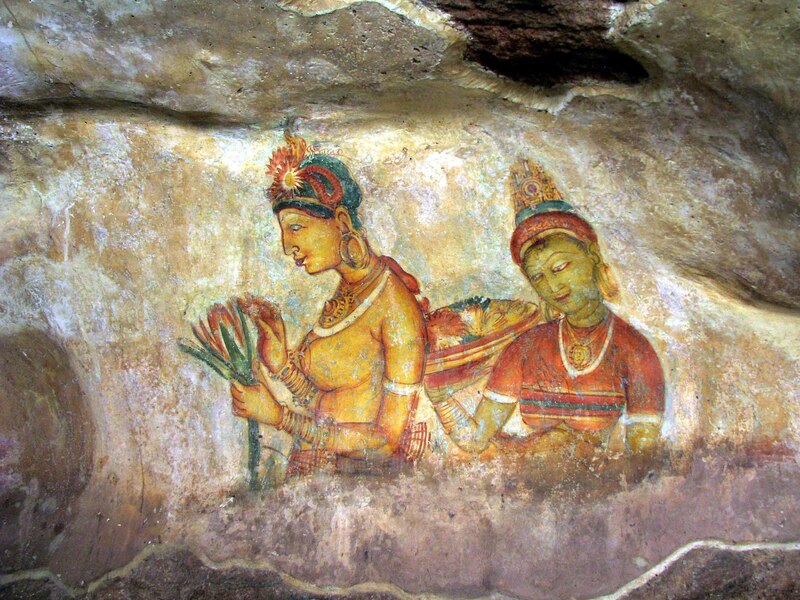 The frescoes of Sigiriya inaugurated a pictorial style which endured over many centuries. The poems inscribed on the rock by certain of these admirers, and known as the ‘Sigiri graffiti,’ are among the most ancient texts in the Sinhalese language, and thus show the considerable influence exerted by the abandoned city of Kassapa I on both literature and thought. 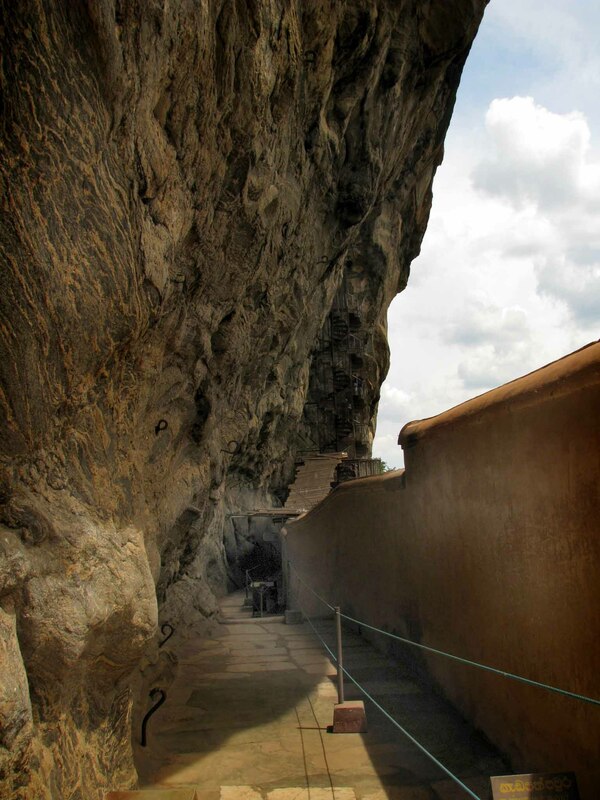 Beyond the fresco gallery, the pathway circles the sheer face of the rock, and is protected by a 3m high wall. This wall was coated with a mirror-smooth glaze, in which visitors over 1000 years ago noted their impressions of the women in the gallery above. The graffiti was mostly inscribed between the 7th and 11th Century AD. Many have been deciphered and published. The graffiti is a great source for the scholars to study the development of the Sinhala language and script. “The ladies who wear golden chains on their breasts beckon to me. Now I have seen these resplendent ladies, heaven has lost its appeal for me”. 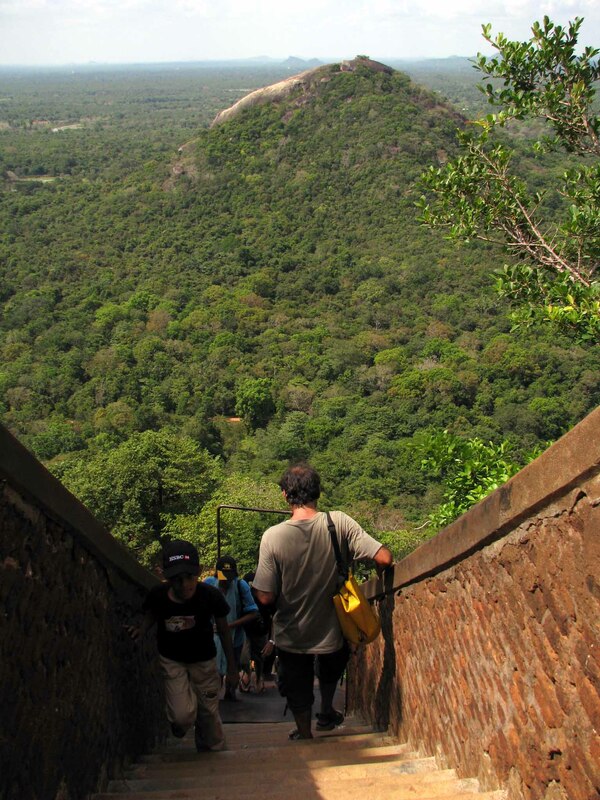 So having waxed lyrical about Sigiriya and given you the text book version let me tell you about our visit. The site is divided into 4 main sections the gardens, water and boulder, the lower city where the monks and residents lived, the frescoes and mirror wall, the lions paws and the summit where only the king and his queen were allowed to go. The climb is a killer and anyone with heart problems should not attempt it unless they take a resuscitation kit and attach themselves to a group of visiting paramedics. 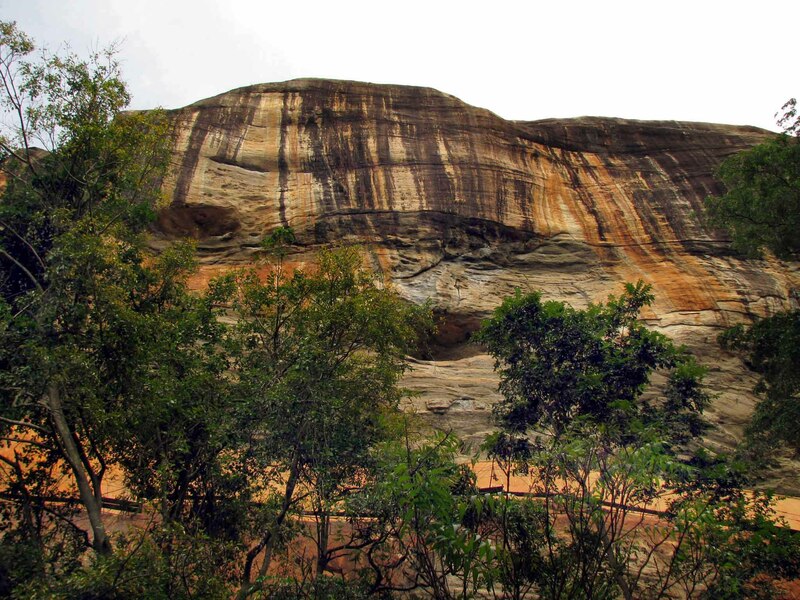 Anyone scared of heights should also think twice before attempting this gargantuan rock – some of the drops are sheer, the frescoes are accessed via a spiral staircase held onto the rock by rusty iron anchorage thingys and if they popped out you would free fall to your death. With foresight the curators have enclosed the stairs with metal netting but one can still see the sheer drop beneath ones feet when looking down. Having oohed and ahhed at the dusky maidens and wondered why the hell you put your life at risk for a few paintings, you then walk along the mirror wall and attempt to read ancient graffiti. This bit is a lot more edifying, as the poems above indicate, and just goes to show that ancient graffiti artists were a lot more insightful and literate than today’s wall artists who’s one line tag of “Shaz Woz here ” tend not to add anything meaningful to the lives of current readers or, unlike the mirror wall’s inscriptions, to those living 1000 years in the future. It is also a great demonstration of how the concept of beauty has changed since some of the pictures look like men in drag (well to my eye anyway) . Heading up more steps one reaches the lion’s paws – originally half a lion front, where there were stone steps that led all the way up to the summit. However, most of them have fallen away and once again iron steps have been secured to the side of a sheer wall and the ascent/ descent is bloody terrifying for those of us who do not have a head for heights. However, that all said, once you are over the shock of still being alive, your heart palpitations have dissapated and you can actually breathe easily (takes about 30 minutes lying on your back in the shade) the views from the top of the rock are spectacular, the sense of achievement overwhelming, and the terror of having to go back down again not as yet registered. As each of the sites in this area tend to be quite expensive if you had to choose one, have health problems and/or no head for heights – give this place a miss and choose one of the other amazing sites in the area. I’m glad I did it but with hindsight if I’d of known how strenuous and terrified I would be, I would definitely have picked differently.